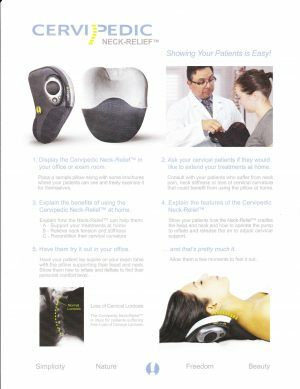 The CerviPedic Neck-Relief™ is a naturally shaped head support that relieves tension in your neck. lt was originally designed to ease the stresses of travel, but is actually ideal for anyone seeking relief from neck tension and stiffness anywhere you can recline. Neck and shoulder tension prevents all of us from doing the things we love to do. lt occurs from constantly straining our bones and muscles to hold up the weight of our heads. The CerviPedic Neck-Relief™ gently supports that weight and relieves pressure. With everyday demands, everyone suffers from unwelcome neck tension at some time. 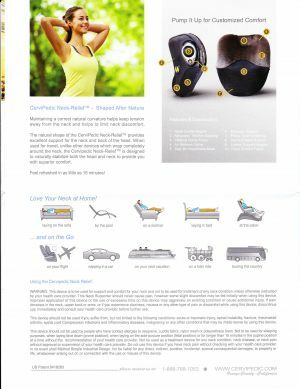 Enjoy natural relief from tension headaches and stress with the CerviPedic Neck-Relief™. Use the CerviPedic Neck-Relief™ wherever you can recliine. This can be at home, in the car, by the pool or when you travel. The CerviPedic Neck-Relief™ is organically shaped to naturally cradle your head and support the neck's natural curvature. This comfortable device stays in place as your body starts to relax gently stretching your neck, thereby relieving the tension !n the muscles and joints in your neck. 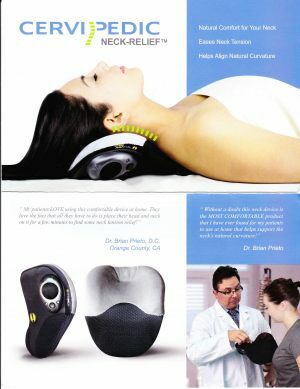 You can enjoy natural relief from tension & stress in your neck with the CerviPedic Neck-Relief™. Maintaining a correct natural curvature helps keep tension away from the neck and helps to limit neck discomfort. 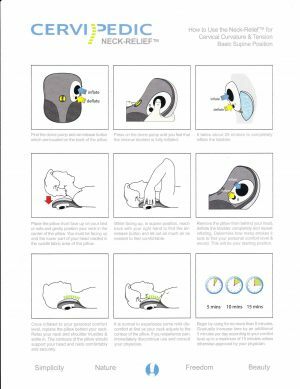 The natural shape of the CerviPedic Neck-Relief™ provides excellent support for the neck and back of the head. When used for travel, unlike other devices which wrap completely around the neck, the Cervipedic Neck-Relief™is designed to naturally stabilize both the head and neck to provide you with superior comfort. Feel refreshed in as little as 15 minutes! Remove any jewelry or clothing such as ties, scarves, hats,bulky collars or sweaters. Long hair should not be gathered on the back of your head, as in a braid or bun, as this will interfere with your head resting in the proper position. 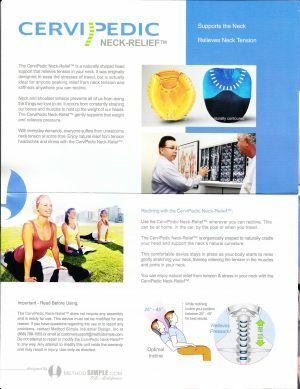 Lay on your back (supine postion only) on a bed or sofa placing the back of your neck on top of the CerviPedic Neck-Relief™while looking toward the ceiling. 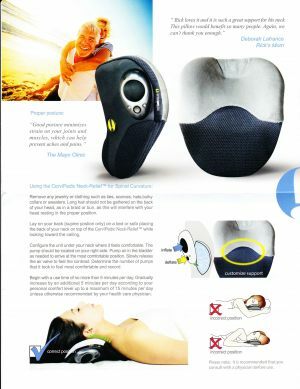 Configure the unit under your neck where it feels comfortable. The pump should be located on your right side. Pump air in the bladder inflate as needed to anive at the most comfortable position. Slowly release the air valve to feel the contrast. Determine the number of pumps that it took to feel most comfortable and record. Begin with a use time of no more than 5 minutes per day. Gradually increase by an additional 5 minutes per day according to your personal comfort level up to a maximum of 15 minutes per day unless otherwise recommended by your health care physician. © 2007 - 2019 Thumper Bloomquist D.C.